Are there any better ways to buy business travel, other than the standard RFP/tender? That’s the question I took on in Lisbon a couple of weeks ago. This slide summarizes my views on four alternatives. With a few exceptions, it’s not a sunny outlook. The good news is that reverse auctions continue to work, to a degree, in the hotel category. They can work in the rental car category (I saw this first-hand ten years ago), but it depends on the rental car suppliers’ willingness to participate. 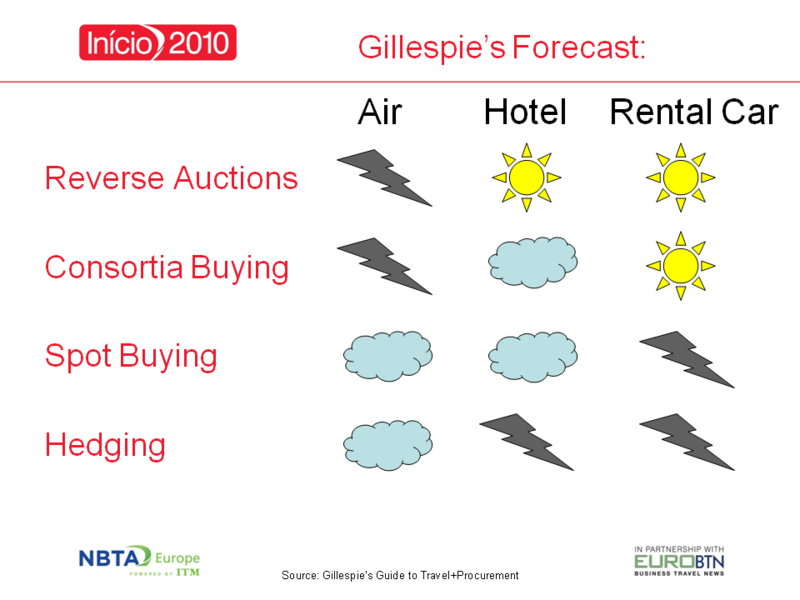 Consortia buying, with a few exceptions, is a non-starter for air, and problematic for hotels. It can work pretty easily for rental cars, so I expect we’ll see more of that over time. Spot buying, where a buyer skips long-term contracts in favor of constantly-adjustable discounts, is a technique that intrigues me, even though it isn’t practical for most travel programs. Hedging, a concept announced nearly two years ago, won’t work anytime soon for hotel or car rental rates. The importance, and by proxy the market size, is just too small. For airfare hedging, it seems it could work, but probably only if the mega-TMCs or credit card firms wanted to get involved. I recently spoke to Denver Lopp about his firm’s progress in this area. “No customers to date, but it’s a long educational road”, he said. Worth noting: long-time industry airfare expert Bob Harrell is working with Lopp to maintain a useful airfare commodity price index. Here’s the 8-page deck that I used in my Lisbon presentation: NBTA Lisbon Over the Hedge It gives a bit more color commentary around my rationale for each forecast. For more thoughts on this topic, please see this post on consortia buying; this post on bulk buying (paying up front); and this post on recapturing your frequent travelers’ miles. This entry was posted in Airlines, Ground Transport, Hotels, Travel Procurement. Bookmark the permalink. Saw the latest article from you..
channel where the company can control their travelers’ hotels. you discounts, you give them more marketshare they’d otherwise get.